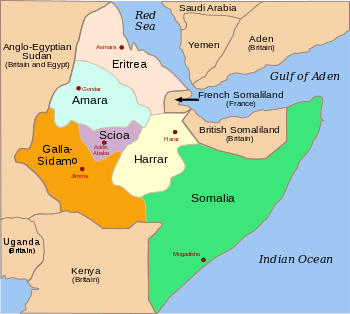 The Second Italo-Ethiopian War, also referred to as the Second Italo-Abyssinian War, was a colonial war that started in October 1935, after a battle on 5 December 1934, and ended in May 1936. The war was fought between the armed forces of the Kingdom of Italy and the armed forces of the Ethiopian Empire (also known at the time as Abyssinia). The war resulted in the military occupation of Ethiopia. Politically, like the Mukden Incident in 1931 (the Japanese annexation of three Chinese provinces), the Abyssinia Crisis in 1935 is often seen as a clear demonstration of the ineffectiveness of the League of Nations. Italy and Ethiopia were member nations and yet the League was unable to control Italy or to protect Ethiopia when Italy clearly violated Article X of the Covenant of the League of Nations. 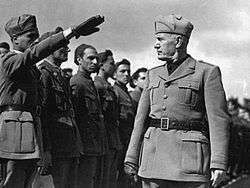 The Italian victory in the war coincided with the zenith of the international popularity of dictator Benito Mussolini's Fascist regime, in a phase called "the age of consensus" during which colonialist leaders praised Mussolini for his actions. 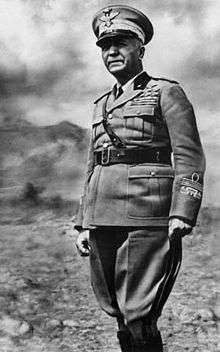 Historian James Burgwyn called Mussolini's victory "a capital achievement". Mussolini's international popularity decreased as he endorsed the Anschluss between Nazi Germany and Austria, beginning a political tilt toward Germany that destroyed Mussolini and the Fascist regime in Italy in World War II. In early December 1934, the tensions on both sides erupted into what was known as the "Wal Wal incident." The resultant clash left approximately 110 Ethiopians and between 30 and 50 Italians and Somalis dead[nb 2] and led to the "Abyssinia Crisis" at the League of Nations. In general, the Ethiopian armies were poorly equipped. 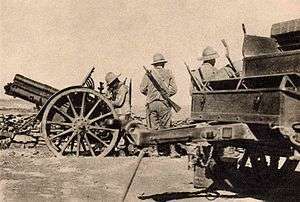 They had about 234 antiquated pieces of artillery mounted on rigid gun carriages, also a dozen of Pak 35/36 anti-tank gun. There were also 800 light and 250 heavy guns (Colt, Hotchkiss), and approximately a hundred of anti-aircraft guns (48 20 mm (1 in) Oerlikons, and some 75 mm Schneiders, and Vickers). The arms embargo imposed on the belligerents by France and Britain disproportionately affected Ethiopia, which lacked the necessary industrial capacity to produce its own weapons. The Ethiopians also had some 300 trucks, 7 Ford A-based armored cars and 4 Fiat 3000 tanks of the World War I age. Upset with Italy's initial objections to the Anschluss in Austria, Germany sent material support to the Ethiopians. This included three airplanes, 10,000 Mauser rifles, and 10 million rounds of ammunition. Adolf Hitler personally ordered the delivery of 30 anti-tank guns and armoured piercing ammunition, while Japan also supplied weapons. Germany would continue to supply Ethiopian guerrillas after the conclusion of formal hostilities until Italy withdrew its appeal for an independent Austria. On 5 October the Italian I Corps took Adigrat, and by 6 October, Adwa was captured by the Italian II Corps. Haile Selassie had ordered Duke (Ras) Seyoum Mangasha, the Commander of the Ethiopian Army of Tigre, to withdraw a day's march away from the Mareb River. Later, the Emperor ordered Commander of the Gate (Dejazmach) Haile Selassie Gugsa, also in the area, to move back 89 and 56 km (55 and 35 mi) from the border. On 14 October, De Bono issued a proclamation ordering the suppression of slavery. However, after a few weeks he was to write: "I am obliged to say that the proclamation did not have much effect on the owners of slaves and perhaps still less on the liberated slaves themselves. Many of the latter, the instant they are set free presented themselves to the Italian authorities, asking 'And now who gives me food'?" The Ethiopians themselves had attempted to abolish slavery, but only in theory. Each Ethiopian Emperor since Tewodros II had issued "superficial" proclamations to halt slavery, but always without real effect. Only with the Italian proclamation of their Empire in summer 1936 was slavery totally and effectively abolished in Ethiopia. It was at the time when the operations for the encircling of Makale were taking place that the Italian command, fearing a rout, followed the procedure which it is now my duty to denounce to the world. Special sprayers were installed on board aircraft so that they could vaporize, over vast areas of territory, a fine, death-dealing rain. Groups of nine, fifteen, eighteen aircraft followed one another so that the fog issuing from them formed a continuous sheet. It was thus that, as from the end of January 1936, soldiers, women, children, cattle, rivers, lakes, and pastures were drenched continually with this deadly rain. To systematically kill all living creatures, to more surely poison waters and pastures, the Italian command made its aircraft pass over and over again. That was its chief method of warfare. 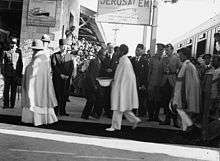 Very early on 2 May, Haile Selassie boarded a train from Addis Ababa to Djibouti on the Imperial Railway, with all the golden treasure of the "Ethiopian Central Bank". From there he fled to England (he was allowed to do so by the Italians who could have bombed and blocked or destroyed his train) and into exile. Before he departed, Haile Selassie ordered that the government of Ethiopia be moved to Gore, he ordered that the mayor of Addis Ababa maintain order in the city until the Italian arrival, and he appointed Ras Imru Haile Selassie as his Prince Regent during his absence. The city police, under Abebe Aregai, and the remainder of the Imperial Guard did their utmost to restrain a growing and ever more restless mob. But, on the first day, attempts to maintain order were abandoned. Soon rioters took control. They rampaged throughout the city; looting and setting fire to shops owned by Europeans. Fascism was never so popular and the shouts of military victory drowned out the muttered grumbles about some underlying economic ills. On 30 June, Haile Selassie spoke at the League of Nations and was introduced by the President of the Assembly as "His Imperial Majesty, the Emperor of Ethiopia" ("Sa Majesté Imperiale, l'Empereur d'Ethiopie"). In response, a group of jeering Italian journalists began yelling insults and had to be ejected before he could speak. The Romanian Chairman, Nicolae Titulescu, famously reacted to the buffoonery exhibited by the Italian journalists. He jumped to his feet and shouted: "Show the savages the door!" ("A la porte les sauvages!"). 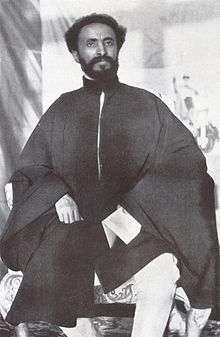 Haile Selassie then gave a stirring speech denouncing Italy's actions and criticizing the world community for standing by. At the conclusion of his speech, which appeared on newsreels throughout the world, he warned that: "It is us today. It will be you tomorrow." The international response to the Italian aggression was mixed. France appeased Italy because it could not afford to risk an alliance between Italy and Germany. Britain decided its military weakness meant it had to follow France's lead. As stirring as Haile Selassie's speech before the League of Nations was, his resolution for the world body to deny recognition of the Italian conquest was defeated. In addition, he was not granted a loan to finance a resistance movement. 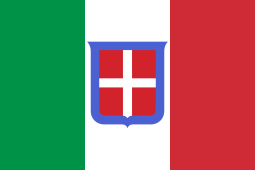 [nb 4] On 4 July 1936, the League of Nations voted to end the sanctions imposed against Italy in November 1935. [nb 5] By 15 July, the sanctions were lifted. Mexico was the only country to strongly condemn Italy's sovereignty over Ethiopia, respecting Ethiopian independence throughout. Mexico was amongst only six nations in 1937 which did not recognize Italy's occupation, along with China, New Zealand, the Soviet Union, the Republic of Spain, and the United States. But three years later, only Joseph Stalin's USSR officially recognized Selassie, and the United States government considered recognizing the Italian Empire with Ethiopia included. In the end, the harsh policies of Graziani did not pacify the country. 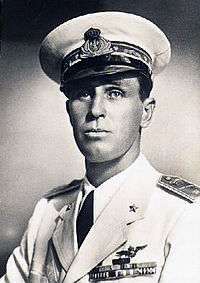 Therefore, on 21 December 1937, Rome appointed Amedeo, 3rd Duke of Aosta, as the new Viceroy and Governor General of Italian East Africa and instructed him to adopt a more flexible line. Accordingly, large-scale public works projects were undertaken. One result was the construction of the country's first system of improved roads. All in all, the Duke brought a program of progressive improvement that included 3,200 km (2,000 mi) of new paved roadways, 25 hospitals, 14 hotels, dozens of post offices, telephone exchanges, aqueducts, schools and shops. The Italians decreed miscegenation to be illegal. 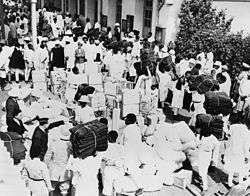 Racial separation, including residential segregation, was enforced as thoroughly as possible and the Italians showed favouritism to non-Christian groups such as the Oromos, the Somalis and other Muslims (many of whom had supported the Italian invasion). 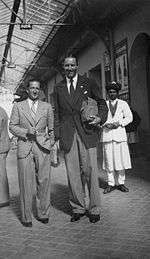 In an attempt to isolate the dominant Amhara rulers of Ethiopia, who supported Haile Selassie I, the Italians granted the Oromos, the Somalis and other Muslims autonomy and rights. The Italians also definitively abolished slavery and abrogated feudal laws previously upheld by the Amharas. 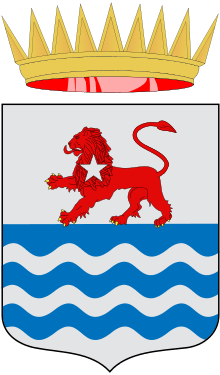 Early in 1938, a revolt broke out in Gojjam, led by the Committee of Unity and Collaboration, which was made up of some of the young, educated elite who had escaped the reprisals after the attempt on Graziani's life. 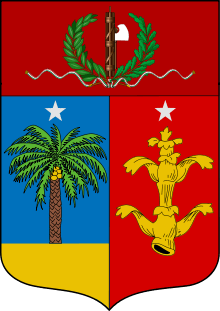 In 1939 ras Sejum Mangascià, ras Ghetacciù Abaté and ras Kebbedé Guebret accepted the Italian Empire and guerilla warfare petered out. 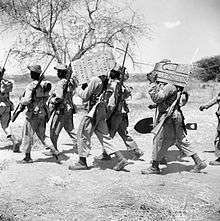 The last area of Ethiopian guerilla activity in early 1940 was around the lake Tana and the southern Gojjam, under the leadership of the degiac Mangascià Giamberè and Belay Zelleke. On 18 January 1941, Emperor Selassie crossed the border into Ethiopia near the village of Um Iddla. Two days later the Emperor joined Gideon Force, a small British-led African regular force. The standard of the Lion of Judah was raised again. By 5 May, the Emperor and an army of Ethiopian Free Forces entered Addis Ababa. Following the Italian defeat, the victorious forces faced a guerrilla war carried out by remnants of Italian troops and their allies that only ended in the last quarter of 1943 after the formal surrender of Italy. The first atrocities were made by Ethiopian troops, who used to mutilate (often with castration) their prisoners: the Eritrean ascari suffered from this treatment since the first weeks of war. 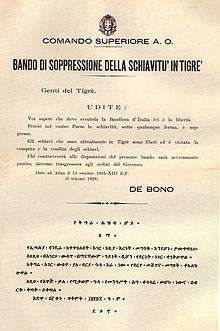 After December the Ethiopians (in addition to the use of Dum-Dum bullets banned by the Hague Convention of 1899, Declaration III) started to do the same even to the Italians: the Italians retaliated with the use of poison gas. However, it is clear that the Italians intended to use poison gas well before the death of Tito Minniti since the gas bombs and cylinders had to be transported by ship through the Suez canal before the start of the war. So, in addition to conventional weaponry, Badoglio's troops also made some use of mustard gas, in both artillery and aerial bombardments. Use of mustard gas, which violated the 1925 Geneva Protocol that Italy had signed, was justified by the deaths of an Italian Air Force pilot, Tito Minniti, and his observer in the Ogaden. "Heroic death of our comrade in barbaric enemy land requires exemplary reprisal punishment", General Graziani ordered on learning of their deaths. 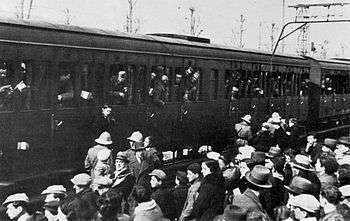 In total, the Italians deployed between 300 and 500 tonnes of mustard gas during the war. The deployment of gas was not restricted to the battlefield, however, as civilians were also targeted by the Italians, as part of their attempt to terrorise the local population. Furthermore, the Italians carried out gas attacks on Red Cross camps and ambulances. Lydia Gowrie Kimber – founder of the British Abyssinian Refugee Relief Committee, organized fund raising and political support for Haile Selassie during his stay in England. He presented a leopard skin to her on his 1967 visit to open the Ethiopian Pavilion at the Expo 67 world's fair in Montreal, Canada. Haile Selassie Gugsa – Dejazmatch who defected and collaborated with the Fascist military of Italy. ↑ According to Time Magazine, 110 Ethiopians were killed and 30 Italians were killed. According to Mockler, 107 Ethiopians were killed and 40 wounded. and 50 Italians and Somalis were killed. 1 2 3 Barker 1971, p. 20. 1 2 Alberto Sbacchi, "The Price of Empire: Towards an Enumeration of Italian Casualties in Ethiopia 1935–1940", in ed. Harold G. Marcus, Ethiopianist Notes, vol. II, No. 2, p.37. 1 2 Sbacchi, The Price of Empire, p.43. ↑ Italian Foreign Policy in the Interwar Period, 1918–1940. Retrieved 24 May 2015. ↑ Mockler, Haile Sellassie's War p.46. ↑ J. Calvitt Clarke, "Japan and Italy squabble over Ethiopia: The Sugimura affair of July 1935", Selected Annual Proceedings of the Florida Conference of Historians, 6 (Dec. 1999): 9–20 Archived 8 June 2010 at the Wayback Machine.. Retrieved 31 December 2008. ↑ "Selassie's Guard Fights on UN Side". Eugene Register-Guard. 2 June 1951. ↑ "Haile Selassie's Draft Order". The Afro American. 17 April 1948. 1 2 3 Barker 1971, p. 29. 1 2 Stapelton, Timothy J. (21 October 2013). A Military History of Africa. ABC-CLIO. p. 203. ISBN 9780313395703. ↑ Barker 1971, p. 57. ↑ Walker, Bruce (19 October 2013). "Recalling the Invasion of Ethiopia". American Thinker. Retrieved 17 October 2016. 1 2 3 Barker 1971, p. 33. 1 2 Barker 1971, p. 35. ↑ "Archivio Storico Istituto Luce - video". Retrieved 24 May 2015. ↑ Barker 1971, p. 36. 1 2 Barker 1971, p. 45. ↑ Barker 1971, p. 56. ↑ "Dai parolai mi guardi Iddio che dagli intenditori mi guardo io di Filippo Giannini - Repubblica Dominicana - Il Corriere d'Italia nel Nuovo Mondo". Retrieved 24 May 2015. ↑ Barker 1971, p. 105. ↑ Barker 1971, p. 70. ↑ Barker 1971, p. 76. ↑ Barker 1971, p. 112. ↑ Barker 1971, pp. 123, 121. ↑ Barker 1971, p. 126. ↑ Barker 1971, p. 109. 1 2 Barker 1971, p. 125. 1 2 3 4 5 Barker 1971, p. 159. ↑ Barker 1971, p. 131. ↑ Barker 1971, pp. 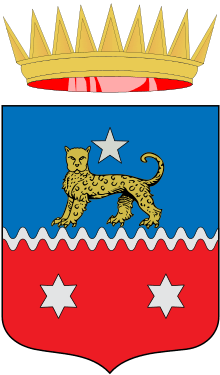 131–132. ↑ Barker 1971, p. 133. ↑ Reynolds M. Salerno, "The French Navy and the Appeasement of Italy, 1937-9." English Historical Review 112#445 (1997): 66-104. ↑ Andrew Old, "‘No more Hoares to Paris’: British foreign policymaking and the Abyssinian Crisis, 1935." Review of International Studies 37#3 (2011): 1383-1401. ↑ Barker 1971, p. 127. ↑ Angelo Del Bocca and Giorgio Rohat (1996). I gas di Mussolini. Editori Riuniti. ISBN 88-359-4091-5. ↑ "WAR STATS REDIRECT". Retrieved 24 May 2015. ↑ Between Bombs and Good Intentions. Retrieved 24 May 2015. ↑ Giorgio Candeloro (1981). Storia dell'Italia Moderna. Feltrinelli. ↑ Angelo del Bocca. Italiani, brava gente? Un mito duro a morire. Colibri. ; A. Mignemi (ed.). Si e no padroni del mondo. Etiopia 1935–36. Immagine e consenso per un impero. Istituto Storico della Resistenza in Provincia Novara Piero Fornara. ↑ Barker 1971, p. 47. ↑ Mockler, Anthony (2003). Haile Selassie's War. Signal Books. ISBN 9781902669533. Gooch, John (2007). Mussolini and His Generals. Cambridge: Cambridge University press. p. 660. ISBN 978-0-521-85602-7. Haile Selassie I, Edited by Harold Marcus with others and Translated by Ezekiel Gebions with others (1999). My Life and Ethiopia's Progress: The Autobiography of Emperor Haile Selassie I, King of Kings and Lord of Lords, Volume II. Chicago: Research Associates School Times Publications. p. 190. ISBN 0-948390-40-9.